This article is about the biblical event and the liturgical commemoration of it. 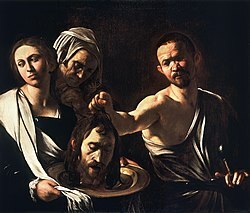 For the paintings, see The Beheading of Saint John the Baptist (Caravaggio) and The Head of St John the Baptist (painting). 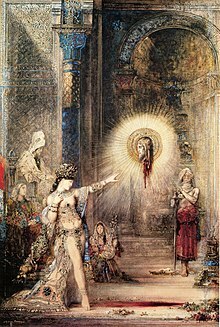 Salome and the Apparition of the Baptist's Head by Gustave Moreau. Watercolor painting. 1876. Now in Musée d'Orsay, Paris, France. According to the Synoptic Gospels, Herod, who was tetrarch, or sub-king, of Galilee under the Roman Empire, had imprisoned John the Baptist because he reproved Herod for divorcing his wife (Phasaelis, daughter of King Aretas of Nabataea) and unlawfully taking Herodias, the wife of his brother Herod Philip I. On Herod's birthday, Herodias' daughter (whom Josephus identifies as Salome) danced before the king and his guests. Her dancing pleased Herod so much that in his drunkenness he promised to give her anything she desired, up to half of his kingdom. When Salome asked her mother what she should request, she was told to ask for the head of John the Baptist on a platter. Although Herod was appalled by the request, he reluctantly agreed and had John executed in the prison. The Jewish historian Flavius Josephus also relates in his Antiquities of the Jews that Herod killed John, stating that he did so, "lest the great influence John had over the people might put it into his [John's] power and inclination to raise a rebellion, (for they seemed ready to do any thing he should advise), [so Herod] thought it best [to put] him to death." He further states that many of the Jews believed that the military disaster that fell upon Herod at the hands of Aretas, his father-in-law (Phasaelis' father), was God's punishment for his unrighteous behavior. None of the sources gives an exact date, which was probably in the years 28-29 AD (Matthew 14:1-12; Mark 6:14-27; Luke 9:9) after imprisoning John the Baptist in 27 AD (Matthew 4:12; Mark 1:14) at the behest of Herodias his brother's wife whom he took as his mistress. (Matthew 14:3-5; Mark 6:17-20); According to Josephus, the death took place at the fortress of Machaerus. The liturgical commemoration of the Beheading of St. John the Baptist is almost as old as that commemorating his birth, which is one of the oldest feasts, if not the oldest, introduced into both the Eastern and Western liturgies to honour a saint. The Roman Catholic Church celebrates the feast on 29 August, as does the Lutheran Church. Many other churches of the Anglican Communion do so as well, including the Church of England, though some designate it a commemoration rather than a feast day. The Eastern Orthodox and Byzantine Catholic churches also celebrate this feast on 29 August. 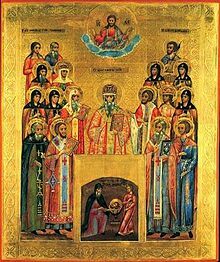 This date in the Julian Calendar, used by the Russian, Macedonian, Serbian and Ethiopian Orthodox Churches, corresponds in the twenty-first century to 11 September in the Gregorian Calendar. The day is always observed with strict fasting, and in some cultures, the pious will not eat food from a flat plate, use a knife, or eat round food on this day. The Armenian Apostolic Church commemorates the Decollation of St. John on the Saturday of Easter Week, while the Syriac Orthodox, Indian Orthodox, and Syro-Malankara Catholic Churches commemorate his death on 7 January. First and Second Finding of the Head of St. John the Baptist (24 February). According to church tradition, after the execution of John the Baptist, his disciples buried his body at Sebaste, but Herodias took his severed head and buried it in a dung heap. Later, Saint Joanna, who was married to Herod's steward, secretly took his head and buried it on the Mount of Olives, where it remained hidden for centuries. The First Finding occurred in the fourth century. The property on the Mount of Olives where the head was buried eventually passed into the possession of a government official who became a monk with the name of Innocent. He built a church and a monastic cell there. When he started to dig the foundation, the vessel with the head of John the Baptist was uncovered, but fearful that the relic might be abused by unbelievers, he hid it again in the same place it had been found. Upon his death, the church fell into ruin and was destroyed. The Second Finding occurred in the year 452. During the days of Constantine the Great, two monks on a pilgrimage to Jerusalem reportedly saw visions of John the Baptist, who revealed to them the location of his head. They uncovered the relic, placed it in a sack and proceeded home. Along the way, they encountered an unnamed potter and gave him the bag to carry, not telling him what it was. John the Baptist appeared to him and ordered him to flee from the careless and lazy monks, with what he held in his hands. He did so and took the head home with him. Before his death, he placed it in a container and gave it to his sister. After some time, a hieromonk by the name of Eustathius, an Arian, came into possession of it, using it to attract followers to his teaching. He buried the head in a cave, near Emesa. Eventually, a monastery was built at that place. In the year 452, St. John the Baptist appeared to Archimandrite Marcellus of this monastery and indicated where his head was hidden in a water jar buried in the earth. The relic was brought into the city of Emesa and was later transferred to Constantinople. Third Finding of the Head of St. John the Baptist (25 May). The head was transferred to Comana of Cappadocia during a period of Muslim raids (about 820), and it was hidden in the ground during a period of iconoclastic persecution. When the veneration of icons was restored in 850, Patriarch Ignatius of Constantinople (847-857) saw in a vision place where the head of St. John had been hidden. The patriarch communicated this to the emperor Michael III, who sent a delegation to Comana, where the head was found. Afterwards, the head was again transferred to Nyc, and here on 25 May, it was placed in a church at the court. "Head of St John the Baptist" redirects here. For the painting, see The Head of St John the Baptist (painting). A Muslim shrine dedicated to Saint John the Baptist, Umayyad Mosque, Damascus, Syria. A 1742 Tarì coin of the Knights Hospitaller, depicting the head of Saint John the Baptist on a round silver platter. According to ancient tradition, the burial place of John the Baptist was at Sebaste, near modern-day Nablus in the West Bank, and mention is made of his relics being honored there around the middle of the fourth century. The historians Rufinus and Theodoretus record that the shrine was desecrated under Julian the Apostate around 362, the bones being partly burned. A portion of the rescued relics was carried to Jerusalem, then to Alexandria, where, on 27 May 395, they were laid in the basilica that was newly dedicated to John the Baptist on the former site of the temple of Serapis. The tomb at Sebaste continued, nevertheless, to be visited by pious pilgrims, and St. Jerome bears witness to miracles being worked there. Today, the tomb is housed in the Nabi Yahya Mosque ("John the Baptist Mosque"). What became of the head of John the Baptist is difficult to determine. Nicephorus and Symeon Metaphrastes say that Herodias had it buried in the fortress of Machaerus (in accordance with Josephus). Other writers say that it was interred in Herod's palace at Jerusalem; there, it was found during the reign of Constantine and thence secretly taken to Emesa, in Phoenicia, where it was concealed, the place remaining unknown for years, until it was manifested by revelation in 453. Roman Catholic tradition holds that the head on display in San Silvestro in Capite in Rome is that of John the Baptist, discovered for the second time,[not in citation given] as also maintained by Pope Benedict XVI in August 2012. Islamic tradition maintains that the head of Saint John the Baptist was interred in the once-called Basilica of Saint John the Baptist in Damascus. Pope John Paul II visited the tomb of John the Baptist at the Umayyad Mosque during his visit to Syria in April, 2001. Consequently, Muslims also believe that Jesus Christ will return to this location in the Second Coming. In medieval times, it was rumored that the Knights Templar had possession of the head, and multiple records from their Inquisition in the early 14th century make reference to some form of head veneration. 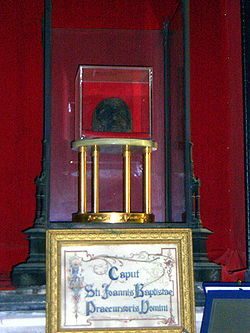 Amiens Cathedral claims the head as a relic brought from Constantinople by Wallon de Sarton as he was returning from the Fourth Crusade. Some believe that it is buried in Turkish Antioch or southern France. It is believed[by whom?] that a piece of his skull is held at the Romanian skete Prodromos on Mount Athos. A reliquary at the Residenz in Munich, Germany, is labeled as containing the skull of John the Baptist. According to tradition, Luke the Evangelist went to the city of Sebaste, from which he took the right hand of the Forerunner (the hand that baptized Jesus) and brought it to Antioch, his home city, where it performed miracles. It is reported that the relic would be brought out and shown to the faithful on the Feast of the Exaltation of the Cross (14 September). If the fingers of the hand were open, it was interpreted as a sign of a bountiful year; if the hand was closed, it would be a poor harvest (September 1 was the beginning of the liturgical year and the harvest season). On January 7, the Orthodox Church celebrates the Feast of the Transfer of the Right Hand of the Holy Forerunner from Antioch to Constantinople in 956 and the Miracle of Saint John the Forerunner against the Hagarines at Chios. In 1204, after the Sack of Constantinople by the Crusaders, the Frankish emperor Baldwin gave one bone from the wrist of Saint John the Baptist to Ottonus de Cichon, who in turn gave it to a Cistercian abbey in France. It is said John the Baptist's arm and a piece of his skull can be found at the Topkapı Palace in Istanbul, Turkey. At the time of Mehmed the Conqueror, the skull was held in Topkapı, while after his death, his stepmother Mara Branković, a Serbian princess, brought it to Serbia. It was then kept a while at the Dionisios monastery at Mount Athos, then the skull fragment was sent to a nearby island in order to prevent the outbreak of a plague; however, the Ottoman fleet seized it and delivered it to Hasan Pasha of Algeria, who held it in his home until his death. It was then returned to Topkapı. The skull is kept on a golden plate decorated with gold bands with gems and Old Serbian inscriptions. The plate itself is stored in a 16th-century rock crystal box. John's arm was brought from Antioch to Constantinople at the time of Constantine VII. It was kept in the Emperor's chapel in the 12th century, then in the Church of the Virgin of the Pharos, then in the Church of Peribleptos in the first half of the 15th century. Spanish envoy Clavijo reported that he saw two different arms in two different monasteries while on a visit to Constantinople in 1404. With the Fall of Constantinople, the Ottomans seized possession of it. In 1484, Bayezid II sent it the knights of Rhodes, while they held his brother Cem captive in return. In 1585, Murad III had the arms brought from Lefkosia castle to Constantinople (henceforth known as Istanbul). The arm is kept in a gold-embellished silver reliquary. There are several inscriptions on the arm: "The beloved of God" on the forefinger, "This is the hand of the Baptist" on the wrist, and "belongs to (monk) Dolin Monahu" on the band above the elbow. In the year 1484, the right hand of the Forerunner was given by the son of Sultan Bayezid II to the Knights Hospitaller on the island of Rhodes in order to gain their goodwill. The Knights later brought the relic with them when they moved the Order to Malta. When Napoleon conquered Malta in 1798, it was one of the few treasures that Grand Master Ferdinand von Hompesch was permitted to remove from the island. On 12 October 1799, after the resignation of Hompesch, it was presented, together with the other Malta treasures — the icon of the Madonna of Philermos and a splinter of the True Cross — to Russian emperor Paul I, who had been elected the new Grand Master of the Maltese Order, and taken to the chapel of the Priory Palace at Gatchina in Russia. After Paul's death in 1801, the relic was transferred to the Winter Palace in St. Petersburg and survived the storming of the Winter Palace during the Bolshevik Revolution of 1917, because it was at the church in Gatchina, together with the other relics of the Knights, for a celebration in their honour on 12 October. The relic eventually went to the Ostrog monastery in Montenegro and from there to its current location at Cetinje Monastery also in Montenegro. The right hand is also reputed to be kept at the Dionysiou monastery on Mount Athos. Relics of John the Baptist are said to be in the possession of the Coptic Orthodox Monastery of Saint Macarius the Great in Scetes, Egypt. In July 2010, a small reliquary was discovered under the ruins of a 5th-century monastery on St. Ivan Island, Bulgaria. Local archaeologists opened the reliquary in August and found bone fragments of a skull, a hand and a tooth, which they believe belong to John the Baptist, based on their interpretation of a Greek inscription on the reliquary. The Bulgarian Orthodox bishop who witnessed the opening speculated that the relics might have been a gift from an 11th-century church on the island possibly dedicated to the saint. The remains have been carbon-dated to the 1st century. A reliquary with a finger of Saint John the Baptist is in the Nelson-Atkins Museum of Art in Kansas City, Missouri. On August 29, 2012, during a televised public audience at the summer palace of Castel Gandolfo, Pope Benedict XVI mentioned the dedication of a crypt in Sebaste, Samaria, where the head of the Baptist had been venerated since the middle of the fourth century. In addition, the Pontiff also noted that the religious feast particularly commemorates the transfer of this relic, now enshrined in the Basilica of San Silvestro in Capite in Rome. Herod's Feast, Daurade Monastery, c. 1100, Musée des Augustins, Toulouse. ^ Flavius Josephus. Jewish Antiquities Archived 2007-04-19 at the Wayback Machine XVIII, v, 2. ^ Nicephorus Ecclesiastical History I, ix. See Patrologia Graeca, cxlv.-cxlvii. ^ a b "Benedict XVI, General Audience, August 29, 2012". Vatican.va. 29 August 2012. Archived from the original on 18 July 2014. Retrieved 25 December 2014. ^ Hooper, Simon (30 August 2010). "Are these the bones of John the Baptist?". Cable News Network. Turner Broadcasting System, Inc. Retrieved 31 August 2011. ^ a b Aydın, Hilmi (2010-02-16). The Sacred Trusts: Pavilion of the Sacred Relics, Topkapı Palace Museum . p. 150. ISBN 9781932099720. ^ a b Grima, Noel (25 July 2010). "Re-establishing a long-lost connection". Malta Independent. Archived from the original on 15 March 2012. Retrieved 24 June 2011. ^ Hamer, Galina Puntusova, David. "History of the Priory Palace". history-gatchina.ru. ^ "Cetinje - The Old Royal Capital of Montenegro | Relics". The City of Cetinje. Archived from the original on 9 October 2011. Retrieved 24 June 2011. ^ "The Monastery of St. Macarius the Great". www.stmacariusmonastery.org. ^ Brooke, Chris (15 June 2012). "Bring me the knuckle of John the Baptist: Scientists claim 'positive' tests on 1st-century relics which are from one man, from the right place at the right time". Mail Online. Retrieved 29 August 2013. ^ "Reliquary with Finger of Saint John the Baptist - Nelson-Atkins Museum". Flickr. Wikimedia Commons has media related to Execution of John the Baptist.